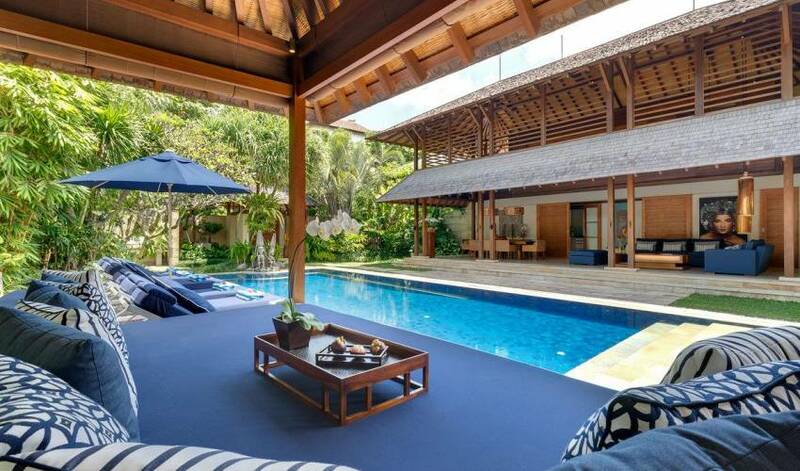 Villa Windu Sari is an elegant four-bedroom residence situated in a secure and private, gated estate in the heart of fashionable Petitenget on Bali's south-west coast. 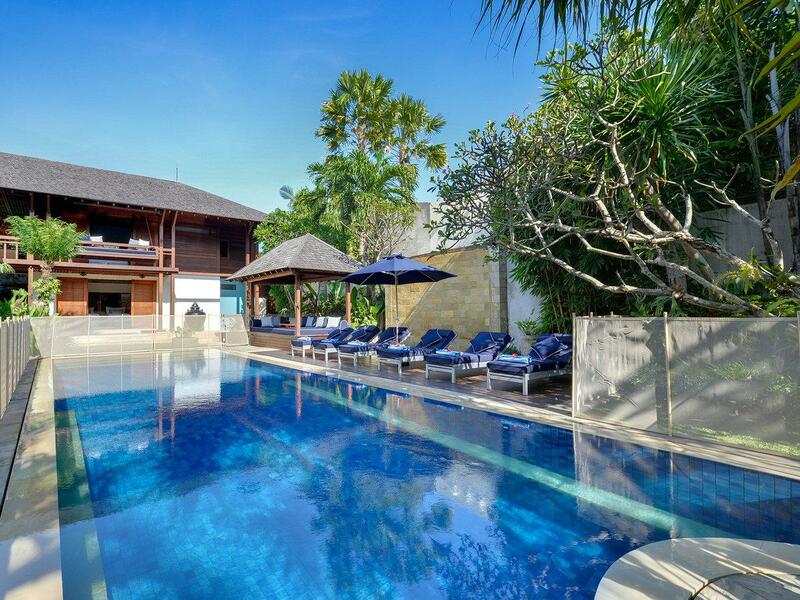 The villa is within walking distance, or a short taxi ride, of Legian beach and the many chic boutiques, restaurants and beachclubs, vibrant nightspots and sumptuous spas of Bali's hip and happening Seminyak area. 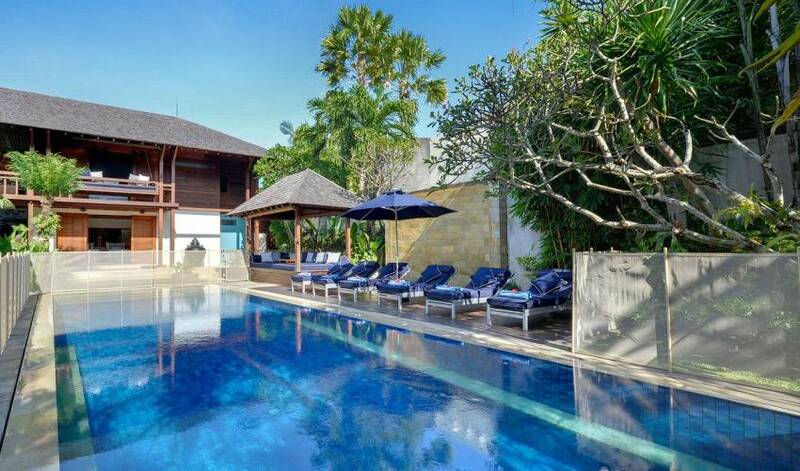 Positioned in a beautiful garden, the luxurious holiday villa features semi-alfresco living and dining areas, an air-conditioned media room and gym, a 14-metre swimming pool and high-tech facilities.It is fully staffed with personal butlers and a professional chef, and is perfect for family holidays. 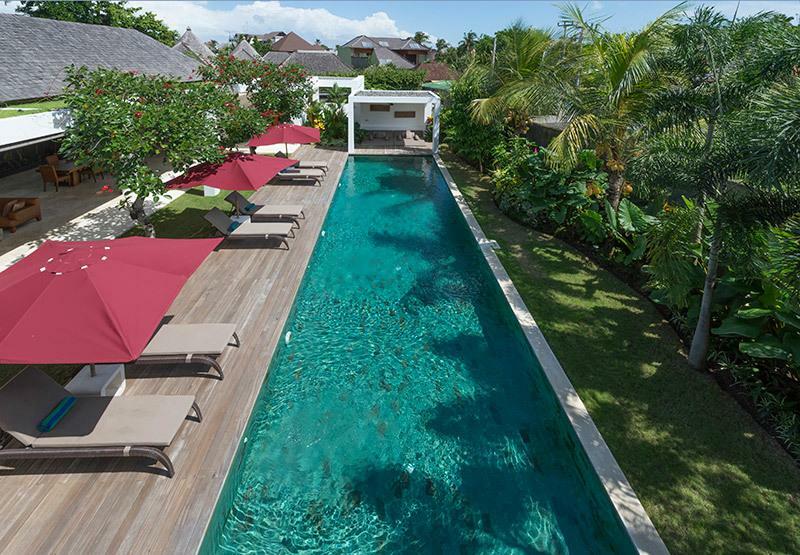 "Windu Sari" - which loosely translates as "a beautiful place in time" is a peaceful oasis in the heart of Petitenget on Bali's southwest coast. 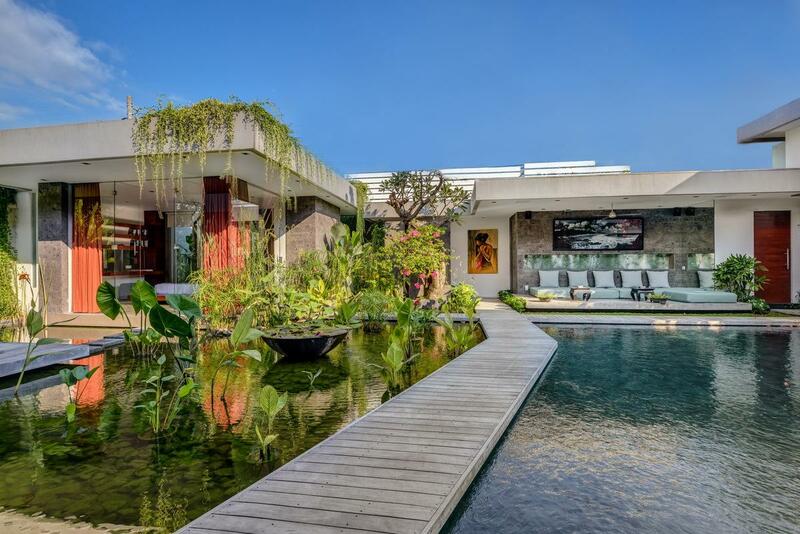 Entered via a traditional Balinese gateway, the villa is set within a gorgeous garden courtyard, complete with a 14 metre swimming pool and an exotic collection of flowering, tropical plants and trees. 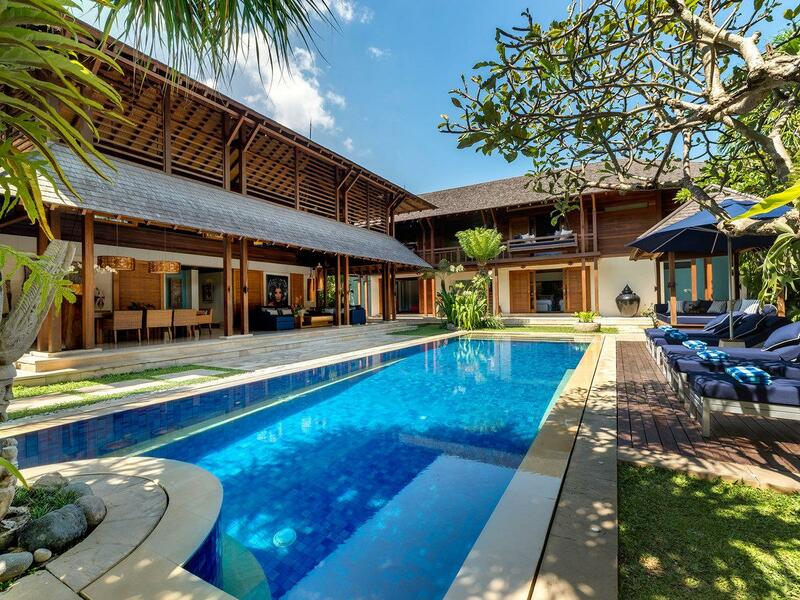 This contemporary-styled, luxury villa is characterised by an abundance of teakwood and marble, and comprised of two, double-storey, shingle-roofed pavilions housing four bedrooms - each with an ensuite bathroom, a magnificent open-sided lounge and dining area, a cosy media room, an entertainment terrace, gym, kitchen and staff-service area. The villa is securely located within a small private estate, the entrance of which is monitored 24 hours, with an additional night-security-guard on duty directly outside the front entrance. 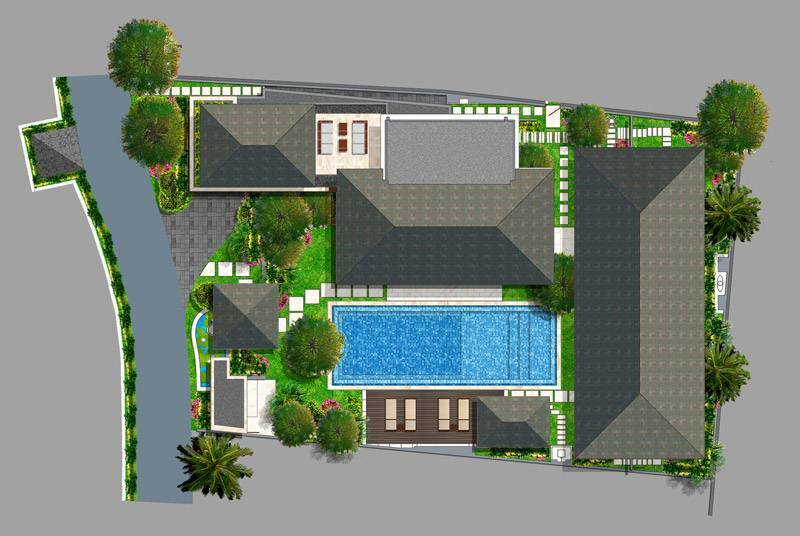 The two-storey contemporary villa presents 4 bedrooms with en-suite bathrooms in the "sleeping pavilion", while a separate, adjacent "living pavilion" houses a comfortable open lounge & dining area off a well equipped kitchen and services area. Upstairs is a media room and gymnasium joined by a terrace with an elevated view over the tropical garden and swimming pool. 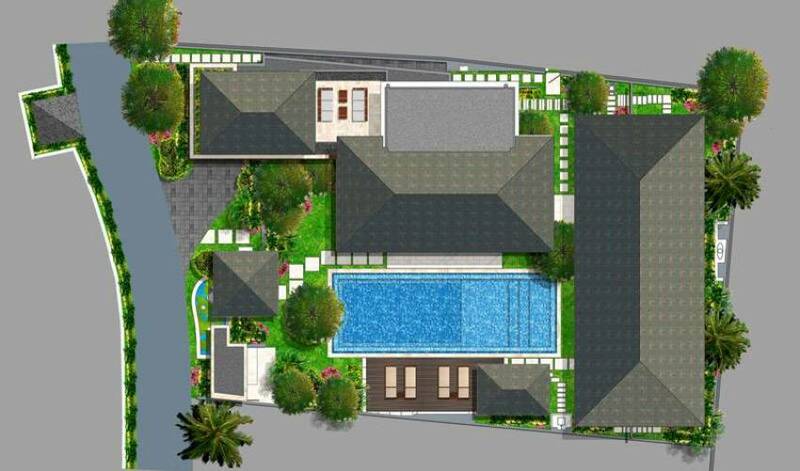 While the attraction of tropical open living is showcased in the lounge & dining area, the 4 bedrooms, media room and gym are all comfortably air-conditioned. 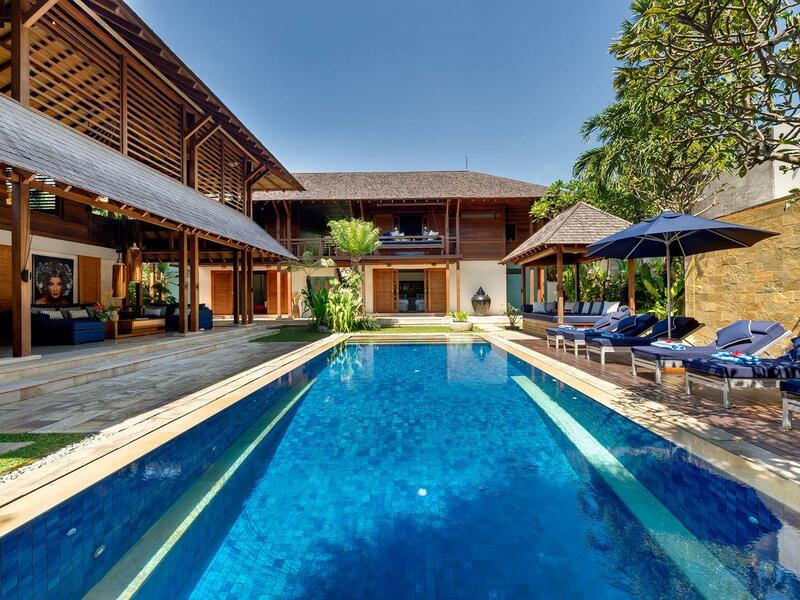 The villa is surrounded by a high stone wall enclosing a lush tropical garden, which incorporates a sparkling, deep-blue swimming pool complete with timber deck. A large open-sided "bale" relaxation pavilion and a Himalayan-stone water cascade are located poolside. The deck is furnished with adjustable sunbeds and an umbrella. An adjacent pool shower is provided for guest convenience. Lush green lawns are bordered by an eclectic selection of tropical plants, flowering shrubs and trees including palms, mini hibiscus, stag horn ferns and orchids. At night the garden and pool take on a different and special persona due to cleverly positioned recessed lighting. The spacious Lounge & Dining Pavilion is characterised by a soaring roof, splendid honey-coloured timber panelling, a creamy-coloured Indian stone wall and polished marble floor. Open on three sides, it is cooled by gentle breezes and ceiling fans and dramatically lit by pendulous copper lanterns. The Lounge Area is furnished with comfortable sofas and ottoman complemented by a glass coffee table with hidden lighting that creates a soft glow at night. Wifi covers this area, and an iPad is available for guest use, and to control the Sonos sound system, which includes an extensive music collection to suit all tastes. This is a great spot to meet for a pre-or-post dinner gathering; the appearance of the garden and pool are equally attractive and appealing by night as they are by day. 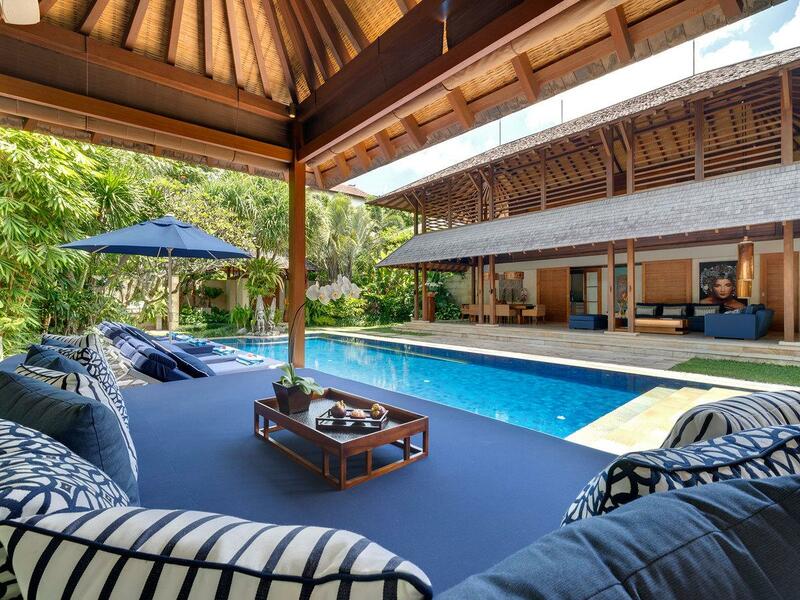 The four bedrooms are situated in a self-contained two-storey "Sleeping Pavilion" positioned at one end of the enticing swimming pool. 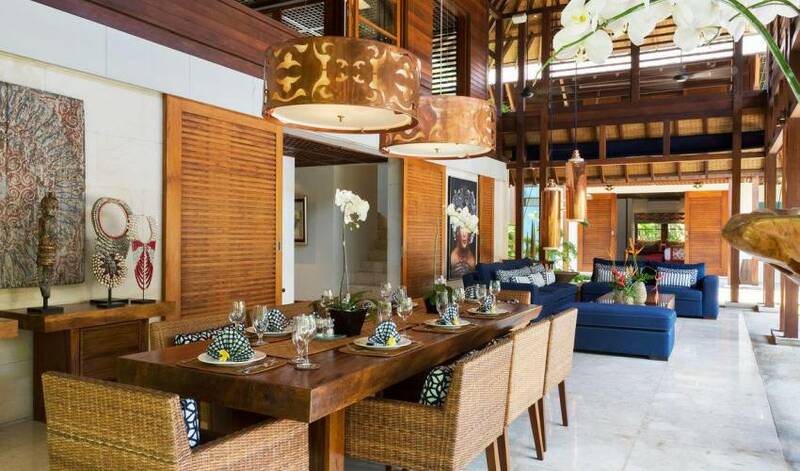 All bedrooms have sliding glass doors with teakwood shutters, timber floors and handmade coffered timber ceilings. Each is equipped with wardrobes, air-conditioning, a safe deposit box, a 40" TV with cable channels, and an iPod docking station. All of the bedrooms offer the choice of a super-king-size configuration or the option of twin king singles. Additional bedding can be provided for children with rollaway beds or cots for infants. This enables small children to share the bedroom facilities with their parents. 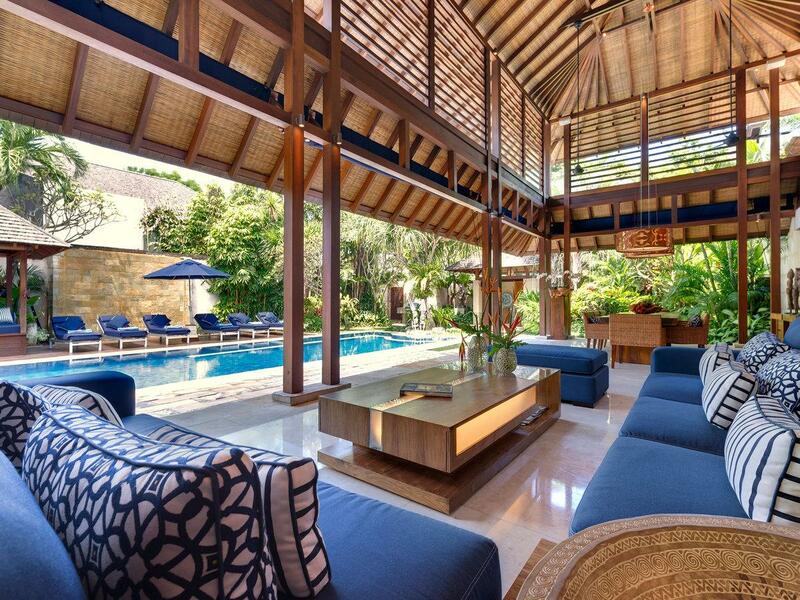 Villa Windu Sari is located in Complex Vila Lumbung at Jalan Petitenget No. 1000x, Seminyak, Bali 80361, Indonesia. Being in the fashionable Petitenget/Seminyak area it is conveniently positioned for shopping and near a growing number of designer boutiques, in addition to a plenitude of sumptuous spas, chic lounges and vibrant nightspots, including the popular Potato Head Beachclub. The villa is a short stroll from Petitenget Beach, which is well-known for its picture-perfect sunsets. 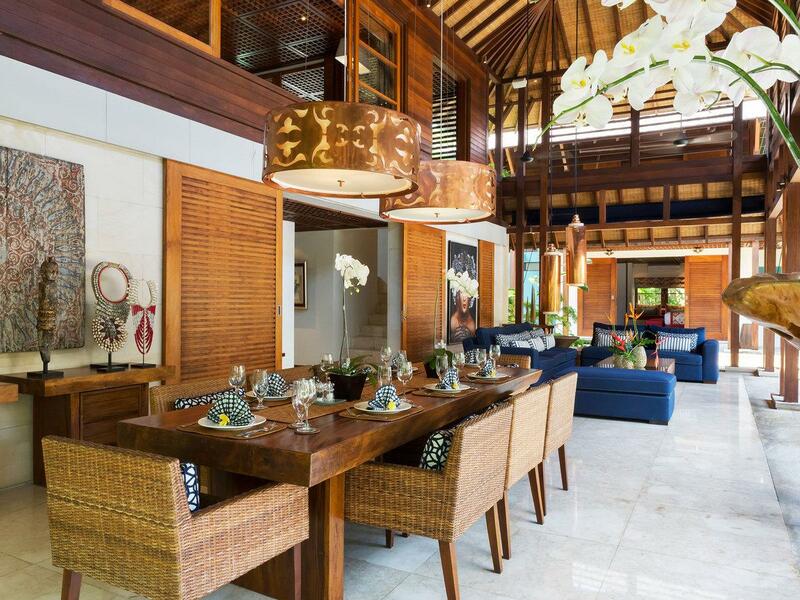 A wide choice of fine dining restaurants, including Ku De Ta, Hu'u Bar & Grill, Metis, La Lucciola, Sardine, Merah Putih, Mozaic Beach Club and Sarong are less than a kilometre away. The location offers easy access to the mountains and rice terraces on the western slopes; it is about one hour's drive (30km) from the cultural and artistic town of Ubud, and just five minutes' drive from the Sunset Route, gateway to the eastern side of the island.